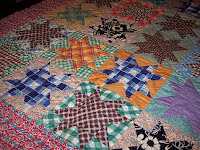 While this blog purports to be about antique quilts, sometimes other things take precedence. Enjoy your holiday. Be with your family. Take a nap. Let the dog tear up the wrapping paper--what a gift for him! And if you're on your own, that's cool too. Make a phone call or two to relations-even if they're a pain. Reward yourself and go buy that hardback book (the one you're waiting for to come out in paperback) and curl up someplace warm. Under a quilt. I first heard the phrase " Anonymous was a woman-" when I read Mirra Bank's book of the same name in the 1980s. But as I study and see yet more 'new' old quilts, I think that anonymous was truly a quilter. Only rarely do I see a signed quilt but when I find a signature, it's a treasure. The name is sometimes quilted into the fabric's surface in same-color thread and is overlooked by the casual observer. Most often it's just the first name, revealing that the maker never thought this quilt might be viewed by someone who didn't know who she was and what her last name was. 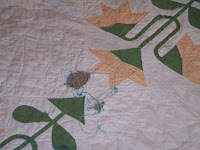 This Rob Peter to Pay Paul quilt I bought on ebay shows the quilter's hand outlined in stitches. Although by any standards a huge piece of work, a handmade quilt large enough for the bed is removed from consideration as "art" since it is a practical domestic object. And it's not hung on the wall like a painting. And it was likely fabricated from common clothing scraps. And it was made by a female. Oh dear. And then there's the 'say it loud, say it proud' group. In case you missed it, this woman's name began with an H.
The Obama logo (the road over the hill) was a media tour-de-force and reminded me of the yellow brick road to Oz. And his campaign associated itself with the lyrics of "Somewhere Over the Rainbow." If you want proof of that, go to YouTube and type in 'Quilters for Obama.' Or click http://www.youtube.com/watch?v=4HlZ75aDzDI . Once I watched that video and listened to the song, I knew who'd be elected. Is it coincidental that the youngest cast member of Australia is a half-Aboriginal boy who seems to have magical powers and unites Kidman and Jackman? And the Japanese bombing the city of Darwin was totally unforeseen--maybe echoes of 9/11? Any symbolism here? I think so. Is there a never-ending supply of great old quilts? Sometimes I wonder. In these tight economic times, I'm seeing some super stuff on ebay and other online sites. As I examine these old quilts, I am always being educated. Here's an interesting detail shot that had lessons for me. It's the easiest feathered star ever. Even I could draft and sew this thing! 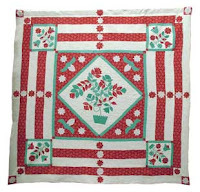 The quilting pattern is so typical of old Midwestern quilts and is called 'Hanging Diamond.' Marked first as a series of horizontal lines, the quilter came back and on a second pass, marked diagonal lines at a 45-degree angle across the horizontals. The muddy brown-purple square at the star's center is a Perkins Purple, a mid-19th century shade that fades upon exposure to sunlight. Note: blog reader Dorothy Daybell has kindly sent me a link to more information about the Perkins Purple so go to http://www.colour-ed.org/activity/act_12/12_transc.htm if you love quilt trivia! Thank you Dorothy. Wahoo-back on the blog again! Google's platform did hinky stuff and wouldn't let me post photos and then boom! Today I can-I feel like a kid in a candy shop. What I really like about old quilts, especially those made by folks who lived in the country, is that their makers didn't know--or didn't care about--the "rules." What are some quiltmaking rules? Oh, stuff like seams have to match and you must use thread the same color as the appliques...details, details. The rule-breakers are my idols. Look closely at this quilt and you discover that the 'trail' is not only serpentine, it is serpents, as in snakes. It sold on ebay and was supposed to have been from the Kentucky hills, home to speaking-in-tongues and snake-handling churches. A little creepy but then again, it ain't all hearts and flowers. 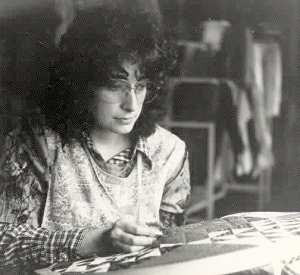 Julie Silber of The Quilt Complex http://www.thequiltcomplex.com/calls these rogue works 'outlaw quilts' and she's curated exhibitions of them. 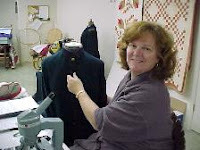 Most people know Julie from her work with the Esprit Collection of fine Amish quilts. Perhaps because of her long association with Amish quilts, you assumed she was quiet and well-behaved a la Amish. Sorry, this textile connoisseur has a wild side and she loves a strange and wonderful quilt. 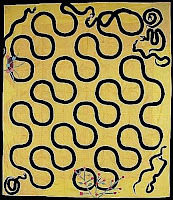 This quilt is from my collection and though similar in its curves to the snake quilt, reads as a much sunnier happier piece and the curves are abtract design elements. Oh boy, does it have some slinky fabric in it! Polyester, rayon, linen, and cotton...all present in this 1960s Flower Power quilt. My hat's off to those ladies who conitnued to quilt through the 1960s and 70s. 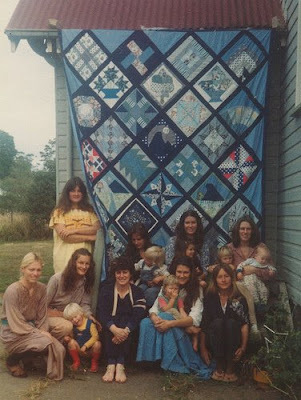 They were our artistic bridge between eras until the quilt revival came into full flower in 1976. 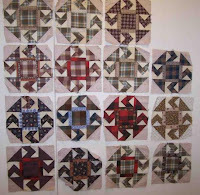 Old quilts have always served as inspiration to my own work and Welsh quilts, as in from Wales (the western-most region of Britain) are one of the oldest sources of America's quilting tradition. 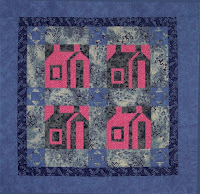 The photo is of a little sample quilt of Welsh-derived design that I show in my Quilt Marking class. 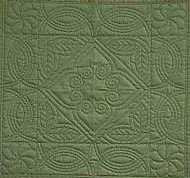 Most often Welsh quilts were made of wool and hand-quilted in whorls, spirals, and other Celtic-like designs. These primarily wholecloth quilts are enjoying a huge revival in the UK. Their patron is no less than Prince Charles whose most famous title is Prince of Wales. Charles and his wife Camilla, Duchess of Cornwall, bought an estate in Wales and refurbished it to serve as a royal residence when visiting in the region. 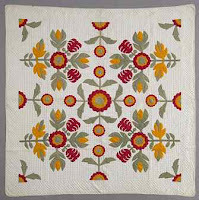 Eleven Welsh quilts were bought from a transplanted Yank, well known antique quilt dealer Jen Jones. This video, if you watch it through to the end, takes the viewer on a tour through the estate and you'll see quilts both on the walls and on the beds. Here's the link: news.bbc.co.uk/2/hi/uk_news/wales/7470135.stm . Occasionally a wonderful Welsh quilt comes up on ebay. Good luck finding one at a reasonable price now that His Majesty has joined the ranks of antique quilt buyers! Here's one that went way out of my price range very quickly. The front is bronze-y green and the backing bright orange. Why don't more of these Welsh quilts turn up? It could be that out of desperation, many Welsh quilts were rolled up, stuffed in the stove, and burned as fuel to keep warm. No kidding. An older Welsh lady told me she remembered her mother doing just that when times were tough. Although it's still summer sultry and sticky here on the Carolina coast, kids are going back to school already. And even if you've been out of school yourself for a million years, there's something about September. Maybe it's those ads for back-to-school supplies that lure me visit the nearest Staples store and purchase shiny new notebooks and crayons of every color. I can resist the urge to splurge if I re-focus my September energies on another symbol of the season. 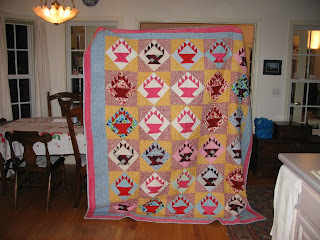 I love Schoolhouse quilts! 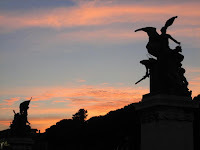 When I see a great one, I want to snap a picture and keep it in my mental 'schoolhouse quilts to do' file. This one from, I think, an ebay auction, is one of my favorites. Love the greys and pinks in the blocks and that double zig-zag border. The blue one was done just for fun but the brown one was made specifically to showcase a line of fabrics I did for Michael Miller in 2004. The best thing about the blue piece is that the strips and background fades nicely and the best thing about the brown one is that the plaids anchor the strips between the blocks. 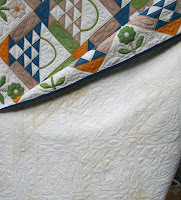 Go figure-I think it's a quiltmaker's prerogative to change the way she does things even when making the same pattern. Studio artists call it "working in a series." I call it messing around. The set (arrangement) of this wall hanging used one of my favorite tricks for defining a border---split blocks around the outside of the patchwork into two opposing triangles light vs. dark and zig-zag 'em next to each other for an interesting final dark triangular border. By the way, this works only if the number of blocks is odd (3, 5, etc) as with an even number, the corners won't work out right. I apologize for not posting about the Quilt Flap promptly. The very next morning after the Flap on June 21, I left for Missouri to do book research and today's the first day back at the computer. Here's the short version of what happened at the Flap: lots more than we hoped for! Interesting and gorgeous quilts spilled out of bags and pillow cases, a lot of coffee and several dozen cookies were devoured, and we all made new friends. Forty three people registered at the door and they came from all over--both North and South Carolina, from Georgia, and even from Virginia. We started at 10 AM with introductions and a little show-n-tell and then morphed into "the orange thing" which is generally me showing off my old cheddar and orange quilts. The old golden beauties couldn't have had a more appreciative audience! Lynn Gorges, game despite a bum knee, gave a presentation on Alamance plaids, those common workaday plaids woven right here in our state of North Carolina, and showed some of her extensive collection of plaid quilts. Lynn runs a textile preservation studio in New Bern. NC. 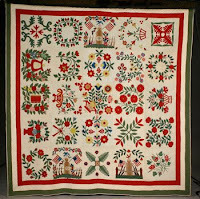 After lunch, Janice Pope (aka 'the quilt doctor') showed us a wonderful find from the Durham area. A small German community church, now simply called Brick Church, seems to have been ground zero for an unusual applique pattern. Janice has located thirteen quilts made with this pattern. Her find is the left picture. 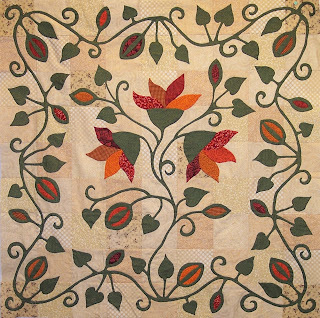 The rick-rack like edging on the applique motif is quite unusual. Another one of the Brick Church quilts was brought to the Flap by Kathy Sullivan of Raleigh (picture right). There will be more pictures from the Flap but these will kick off the first report nicely-enjoy the eye candy! PS-if you attended the Flap, please send me some pictures! A week from today we should be up to our ears in old quilts. Ah--go ahead, throw me into the brier patch.......nothing I'd rather do than root around in old textiles. 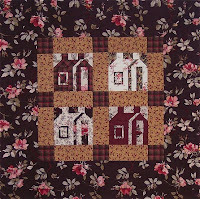 The Quilt Flap is on at the History Place in downtown Morehead City NC on Saturday, June 21. See the sidebar for the short version of the invite. I've been getting emails and calls and yes, there's still room for you! What can you expect to see at the Flap? Likely some wonderful contemporary quilts will walk in since quilters can't resist showing off their work. 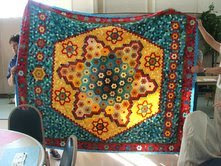 Like this gorgeous Hexagon Medallion by Becki Bucci that came to our local guild's Day of Sharing event a year ago. Isn't this a beauty? Hand made every bit! This should refute any nay-sayer who says the only great quilts are antique quilts. Those quilts kept in chests and boxes that haven't seen daylight in a generation are what we're hoping to see next Saturday. 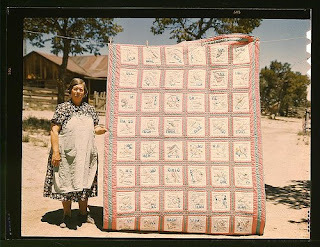 Maybe even ephemera (paper stuff) like this Depression-era photo from the Library of Congress archives that shows a proud quilter (identified as Mrs. Bill Staggs) displaying her embroidered State Flower quilt. The design was by Ruby McKim, a well-known quilt designer in the 1930s whose work was syndicated in many newspapers. Because the craft of quilting is known for people sharing their knowledge in groups, the Quilt Flap is right in that traditional style. Show it and they will come. Since quilters often work in solitary splendor at home, they thrive on encouragement from others. And people who have treasured their beloved family quilts might want information as to how to take care of them. Since this area of North Carolina has an abundance of quilts, we hope people will get those heirlooms out and bring them to the Flap. Here's a picture from Quilt Appreciation Day at the Core Sound Waterfowl Museum on Harker's Island last year. 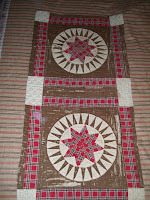 Jan Willis, Lynn's sister-in-law Vickie, and Lynn Gorges are researching the pattern of this vintage quilt. You're bound to hear someone say, "Wow, I wanted to learn to quilt but I didn't think anyone still did it!" Be assured: quilting is alive and well and oh boy, are you in for a treat! All right friends-in three short weeks, the Great North Carolina Quilt Flap is on. Right here, in eastern coastal North Carolina, Morehead City NC to be exact. This is the event this blog was named for and hopefully, this Flap is the first of many. What's a Quilt Flap? It's a show-n-tell, an informal airing of the quilts, it's a "Let's talk all about that quilt and crazy Great-Aunt Minny who made it" day. In the tradition of Southern hospitality, coffee and light refreshments will be served in the morning and a good time will be had by all. When: Saturday, June 21, 2008. Registration and morning tea and coffee starts at 8:30 am. The Quilt Flap commences at 10 sharp. Lunch noon-1 pm. Afternoon session: 1-5 pm or until they kick us out. Where: Auditorium of The History Place, 1008 Arendell Street, Morehead City, North Carolina 28557. Directions: come into downtown Morehead on Route 70 and just as the speed limit drops to 20 mph (no kidding) the History Place is on your left. Turn left on 10th Street before the building, go past the Tea Clipper door, and come around into the parking lot behind the building from Bridges Street. What do I bring? Yourself, your camera, an open mind, and show-n-tell…old quilts of course! Who is going to be there? Folks just like you who are crazy about old quilts. Some museum people, quilt collectors, quiltmakers, historians, and the just plain curious. 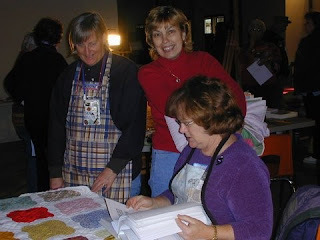 http://www.textilepreservation.com will speak on Alamance plaids and museum work with old textiles. Pepper Cory, The Quilt Studio in Morehead City www.peppercory.com will show her strange cheddar quilts. 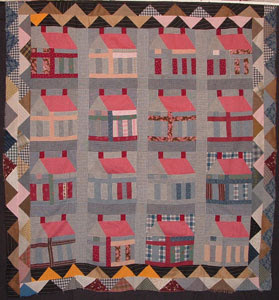 Janice Pope (aka The Quilt Doctor from Cary, NC) will talk about the challenges of repairing old quilts. We hope there will be round tables on various topics and would love to hear from some volunteers who might lead discussions at these tables. Plenty of time for show-n-tell but we might have to limit that to four (4) quilts per person or we’ll be there all night. What the Quilt Flap is not: This event is not an appraisal fair or a selling and buying show. We’re gathering to celebrate the art of the quilt but please leave the money thing for another day. What about lunch? You’re on your own from noon till 1 pm. There are lots of restaurants in downtown Morehead. You can even bring a sack lunch if you’ll pick up after yourself. And if I get lost? You can’t because there’s only one road in and out of downtown Morehead City. You can call the History Place (252) 247-7533 but the best thing to do is Google The History Place, Morehead City, NC and up pops their website www.thehistoryplace.org and a handy map. 2) we’ll pass the basket for a donation toward the cost of the janitor’s pay, the printing of information, and the morning refreshments. Any other questions? Email Pepper Cory (pepcory@gmail.com) to register. Lynn Gorges (palampore@aol.com) is also available for questions. We’ll try our best. Please understand that we both occasionally are on safari working but will get back to you as soon as we can. 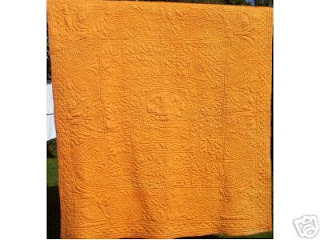 I admit it-one of my all-time favorite colors is that intense golden-orange that quilt collectors now call 'cheddar.' Perhaps, if you're quilt-savvy, those colors say "Southern, late 19th-century, early 20th-century quilt-" but I'd like the association expanded. Sure, I love the teal blue-cheddar of many of my region's older quilts. But then again, inspiration can come from many sources. One of my artistic idols, Vincent Van Gogh, was so sure of the rightness of his favorite color triumvirate that he once wrote to his brother Theo, " There is no blue without yellow and without orange." I concur. This color scheme always turns my head. It's in my head-can't help it. My generation revels in it. Vince would have loved the chopped-down VW wagon and approved of the sentiment. How many of you have actually signed your name into your quilt? Or traced around your hand? 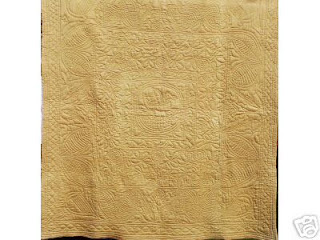 This gives a personal and unique identity to this quilt when described as a "handmade quilt." 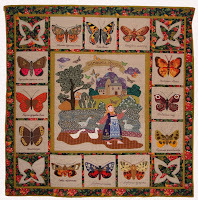 Old country quilts, as in, made in a rural rather than city environment, have a special charm to them. You can almost imagine the lady sitting there, working through her scrap basket, sorting and choosing bits and trying to make the best combinations in her patchwork. 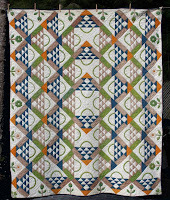 One sort of print tends to turn up in country quilts: geometric lined patterns like homespuns, ginghams, and plaids. Think men's work shirts and house dresses. These are real remnants of clothing from both men and women and are endearing for the reason that real folks wore them. To make the point: here's a piece of antique Mariner's Compass made in black and red plaid. Too bad some "crafter" (I use the term loosely-) cut the quilt up. There's this beauty, fresh as the day it was made in the 1940s, that waltzed into the Quilt Appreciation Day at the Core Sound Waterfowl Museum last February. 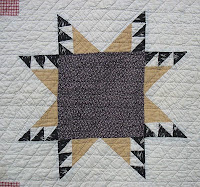 The star quilt was made on Ocracoke Island, North Carolina. 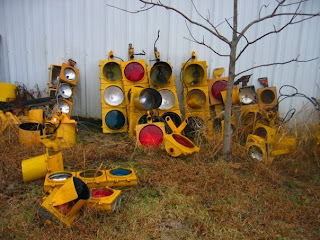 Or this collection of odd blocks, recently seen on ebay-what pattern is that anyway? The lesson for modern quiltmakers is clear: want to make your quilts look country? Better not forget the plaids! 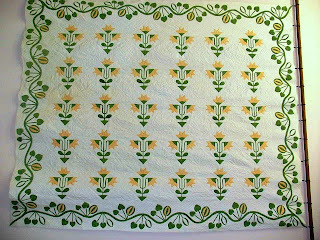 The North Carolina Lily has always been a favorite quilt pattern. In fact, it was the second block I ever made and braving the A word (applique) was worth it for the final effect. I have a wonderful antique Lily quilt in my collection and it was saved from the decorator's scissors (being cut into pillows) none too soon. Although the huge quilt had holes in it and was not exactly clean, Janice Pope from Raleigh, NC (aka the quilt doctor) repaired and washed this c.1860 beauty and I am so proud to have it! She dealt with mouse holes, rotten earlier repairs, missing leaves and stems, lots of popped seams and did a super job. 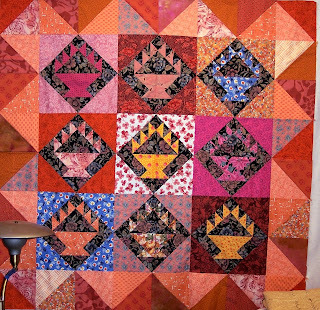 Note: the quilt is hanging from a pole at right but the photo has been revised to show the blocks in an upright position. Inspired by the old Lily quilt, I wanted to make a wall hanging using its outrageous border. But one lone Lily block and that big border was too much, so rather than tone down the border pattern, I started to sketch over a lily block and came up with a much freer design. Meet Wild Lily, a wall hanging that I designed and pieced the background for but all the applique work was stitched by my friend Pinky (Dorothy) Porter from Morehead City, NC. Pinky's a better quilter than I'll ever be. This is the quilt top of Wild Lily. It has since been finished but not photographed. So while we may love antique quits, there's no reason to always make reproductions of them. I could never re-make that pre-Civil War quilt with grace but the wall hanging seems a fitting modern tribute.